This model is intended to look like you literally grabbed some extra hardware from your work bench and assembled the table yourself. This table boasts incredible design and is probably one of the best looking tables that we have laid our eyes on. This would make a great space if you are looking for modern and rustic all in one. 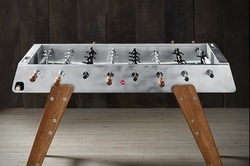 A perennial gamer favorite, foosball pits two teams of rotating foosmen in a miniature soccer match. 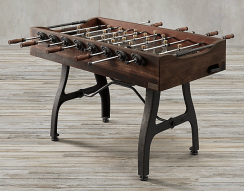 Our handsome tabletop pitch is finely crafted of natural volcanic basalt set in a reclaimed hardwood case and mounted atop sturdy cast iron legs.